U.S. nuclear company Westinghouse Electric is filing for bankruptcy, its Japanese owner Toshiba said Wednesday. 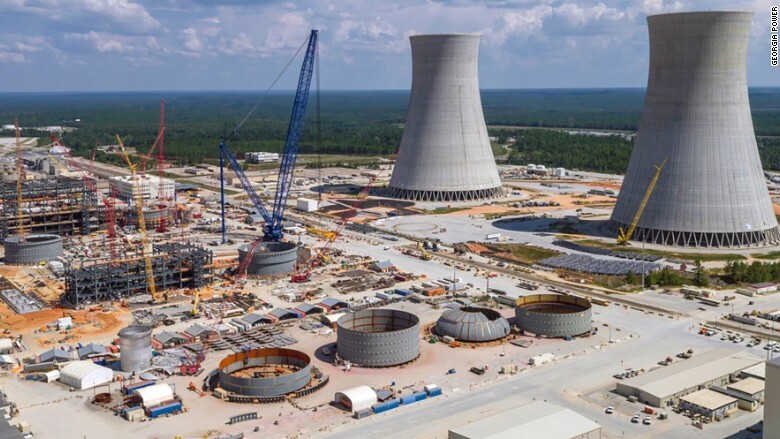 Westinghouse, which was bought by Toshiba in 2006, has suffered billions of dollars in losses due to delays and cost overruns at nuclear plants under construction in Georgia and South Carolina. The bankruptcy filing is the latest embarrassment for the two industrial giants. Huge losses at Westinghouse have thrown its survival into doubt and raised questions about the future of the two U.S. nuclear power projects. The financial disaster has spread to the Japanese firm, which last month wrote down the value of Westinghouse by 712.5 billion yen ($6.4 billion). Toshiba (TOSBF) said the Chapter 11 bankruptcy filing will limit its exposure to future losses at Westinghouse. The U.S. company will no longer be under Toshiba's control and will be stripped out of its financial results, the Japanese conglomerate said. "The environment of nuclear power is so severe at this moment, it was not a sustainable business," said Kazunori Ito, an equity analyst at Morning Star. Westinghouse's bankruptcy filing "is the only way for Toshiba to limit or determine the amount of loss at this point," he said. That loss is going to be huge. Dumping Westinghouse could drag Toshiba to a net loss of about 1 trillion yen ($9 billion) for the financial year ending this month, the Japanese company said Wednesday, nearly three times the 390 billion yen ($3.5 billion) loss it had flagged last month. A nuclear power plant that Westinghouse is building in Georgia. Westinghouse and Toshiba are working with the owners of the two U.S. nuclear power projects to come up with plans to continue construction "during an interim period," the Japanese firm said. It wasn't immediately clear what will happen to the unfinished projects in the long term. Toshiba first warned of a massive hit from its U.S. nuclear unit back in December. Since that news emerged, the company has twice delayed its audited earnings, and its shares have more than halved in value. Westinghouse is what is left today of what was once a major industrial conglomerate that helped change the world during the late 19th and early 20th centuries. Founder George Westinghouse, a prolific inventor, started making air brakes which greatly improved the safety of train travel and freight transportation. He was a key advocate of the alternating electrical current that is still used around the globe today, rather than the direct current which had been pioneered by Thomas Edison. Toshiba is an iconic Japanese company that now faces the threat of being delisted from the Tokyo Stock Exchange because of its delay in publishing earnings and a $1.2 billion accounting scandal that was uncovered in 2015. To help shore up its finances, Toshiba is looking to sell a significant stake in its prized memory chips business. It's a humiliating fall from grace for a company that has been around since the 1870s. Toshiba manufactured Japan's first light bulb and gave the country its first electric washing machines, vacuum cleaners and microwave ovens. Toshiba then charged into the tech industry, making a global name for itself as a pioneer laptop maker and developer of flash memory technology. The company bet big on the nuclear industry in 2006, acquiring Westinghouse for $5.4 billion. It was a bold deal that came at a time of renewed interest in nuclear power. But the meltdown at Japan's Fukushima Daiichi nuclear power plant in 2011 changed things. In the face of souring public opinion on nuclear energy and stricter safety requirements, hopes of a nuclear renaissance soon faded. Analysts said Toshiba paid too much for Westinghouse, forcing it to maintain an aggressive nuclear power plant sales forecast. That led to Westinghouse acquiring nuclear construction business CB&I Stone & Webster in 2015. The deal was supposed to help Westinghouse complete the U.S. reactor projects. Instead, costs spiraled out of control. Toshiba later admitted that it may have overestimated the value of CB&I Stone & Webster.